Do you have a toddler who goes through a few changes of clothes a day too? Playing outdoors, painting, drawing, and regular spills can make the laundry pile up quickly. And that’s just for one member of our household! Add in everything else we need to wash and the amount of money we were spending on a laundry detergent was too high. This post contains some affiliate links for your convenience, read full disclosure policy. 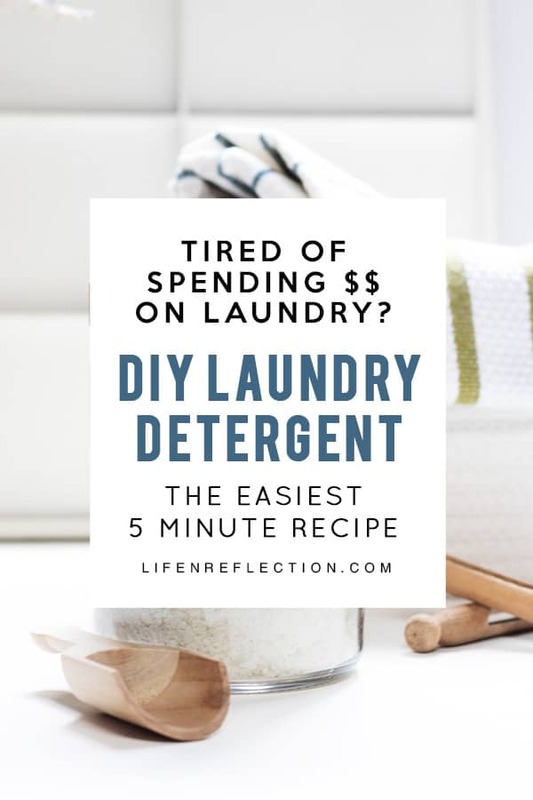 Why Not Buy Cheap Laundry Detergent? Like most cleaners, store-bought laundry detergents are filled with a variety of chemicals known to cause health risks. Beginning with surfactants related to lung, eye, and skin irritation (Bondi, 2015). Continuing to fragrances that cause headaches, skin irritation, and aggravate asthma (Dodson, 2012). In addition to hormone disruptors such as nonylphenol ethoxylate (Bechi, 2010). Yeah… just a reason or two why I don’t recommend buying cheap laundry detergent to save money. 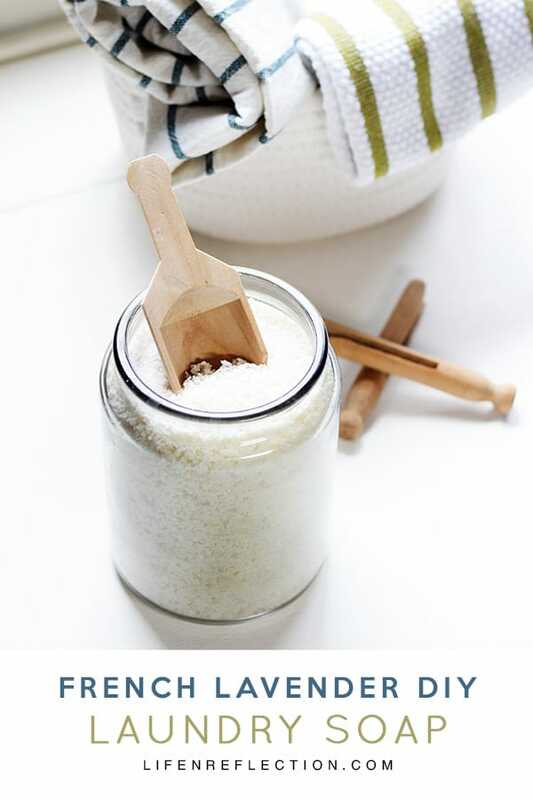 Have you entertained the idea of making your own DIY laundry detergent? Well, you’re not alone. In fact, I had been thinking about making DIY laundry detergent powder for more than a year. Yeah, I know, usually, I’m not a procrastinator. I’m a do-it-yourself person to the core! What was stopping me from making my own? First, it was finding a recipe for homemade laundry detergent without borax. I know borax is a natural cleaning agent and many people use it to clean including Kristen at Live Simply. But, due to the sensitive skin in our house, I myself and toddler included I choose to not include borax. Instead, I opted to use washing soda, it neutralizes and eliminates odor while combating stains. And I found it performs the same function in laundry detergent recipes and store-bought options as borax does. 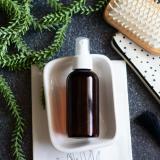 Secondly, I knew I needed to include castile soap in the recipe to lift dirt and stains. And to make DIY laundry detergent for our HE washer is needed to be grated finely. Somehow I pictured in my mind grated the soap would be so tiring and such a long process. Which is why I made liquid laundry soap first! 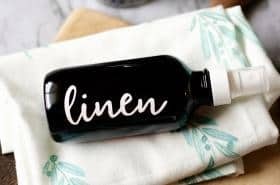 Luckily just around the time I used up all the liquid laundry soap I made, I discovered something that changed everything! I didn’t have to finely hand grate the castile soap to make powder laundry detergent. 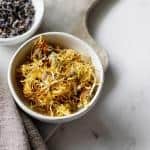 Turns out, I could grate it once and pour the soap right into my food processor – what a game changer! Here’s how you can make homemade laundry detergent in five quick minutes too. Next, add one cup of washing soda, a quarter cup of Epsom salt, and two tablespoons of citric acid. Place the lid on the food processor and pulse on mix until ingredients are powdery. Pour the powder laundry soap into a large glass mixing bowl. 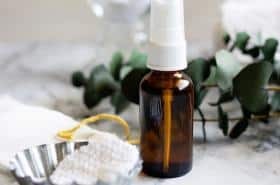 Add two teaspoons of french lavender essential oil while stirring to blend well. 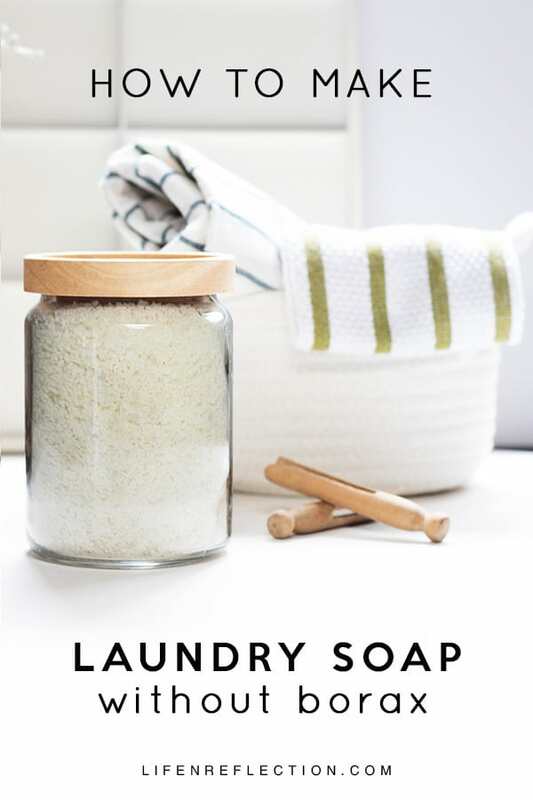 Pour blended french lavender laundry soap into an airtight container until use. 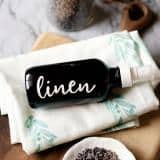 Can you use this homemade laundry detergent for HE washers? You may be wondering why everyone asks this. Well, it’s an important question. HE washing machines stand for High Efficiency. And one of the key reasons is to save water. According to Energy Star and Consumer Reports HE washers use on at least one third less of water! Which is awesome, but this means it works quite differently than standard top load washers. Therefore this powder laundry detergent recipe doesn’t contain a sudsing agent, but the powder needs to be fine – make sure you use your food processor to fine ground everything. 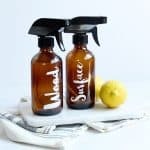 And according to the team at The Spruce powder, liquid, and tablet homemade laundry detergent works well for HE washers. How Much Homemade Laundry Detergent Per Load Should You Use? For powder laundry detergent in an HE washer use the guide below. To use liquid laundry detergent see here. 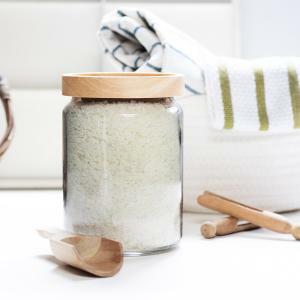 Actually, including Epsom salt in the recipes helps to clean and naturally soften your wash. And there’s one easy step that you can do for homemade or store bought detergents when washing clothes in hard water. Just add your detergent directly to the drum of the washing machine before adding soiled laundry. I’ve never found any clumps or white spots of soap on our clothes when I do just that! Cleaning up your laundry routine is a great step on the path to a natural lifestyle! Being more intentional about what we buy, use, eat, and make is key to living naturally. 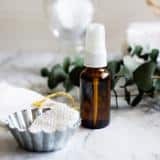 If you’re looking to detox your skin care or just waste less. I’m here to help! Hi Kristy,. so how much of this French Lavender Laundry Detergent Powder do I use per- load in a top loaded washer older style?? 1 tablespoon per load works perfectly. My mother has top load washer too and this works well for her. Just make sure you put in the bottom of the washer 1st before adding clothes or items to be laundered. 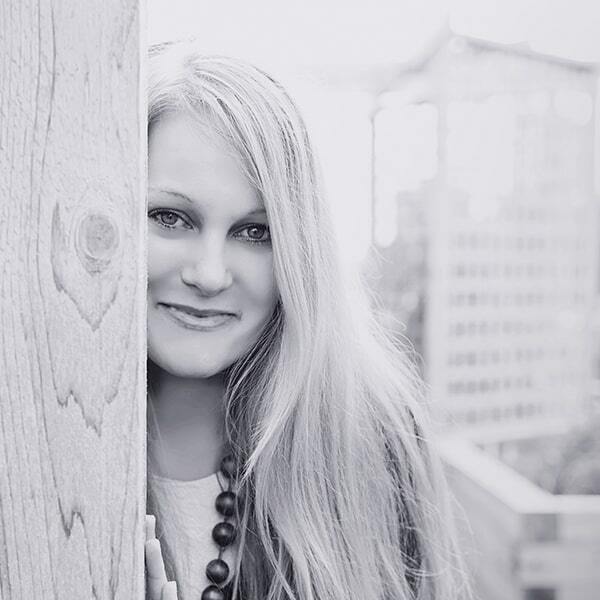 Thanks Kristy…I have another question for you..have you ever made your own washing soda?? apparently you just put baking soda in the oven and bake it at 400 for 1 to 2 hours and that’s it?? So I think I’ll try to make my own, what do you think?? I haven’t, but I have read about it. Let me know how it goes! Ok so I made and used your Recipe for French laundry powder detergent ,I did three loads,do you really want to know what I think lol!.. (( It’s awesome Kristy.. I’m very impressed)) though when I looked in the washer and didn’t see any suds I was a little worried because I’m use to lots of suds..but it still works!! The washing soda I made turned out great and it’s not that hard to make at all.. I’ll try to send you the recipe that I used if you like..I made about 3 cups lol!!.. hope I can find other recipes to use it in ?? Also wanted to ask if there is a difference in ( French Lavender & just regular Lavender essential oils) ? YAY!!! I’m so glad to hear that, we love using it too. 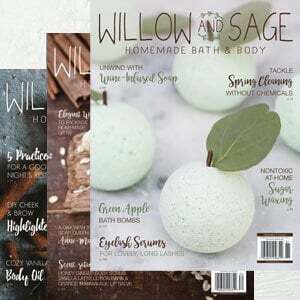 I do have a recipe for homemade dishwasher soap that includes washing soda – I just need to write the article and get it out to you 🙂 As for the essential oil, there’s not much of difference really. 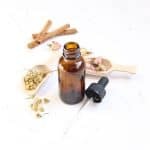 Lavender is like eucalyptus and many other herbs that have several varieties. 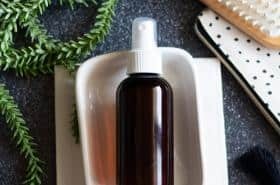 You can use any combo of essential oils that are recommended for cleaning. I have an article that includes all here at Life-n-Reflection. You can find under the natural cleaning tab. Lol!! Kristy great minds think alike…..
there isn’t much out there for stainless steel washers?? Also do you use anything in the rinse aid dispenser? I’LL wait for your recipe !!! Ha ha, I’m pretty sure mine happens to be stainless on the inside and outside! I used distilled white vinegar in the rinse aid dispenser. It works like a charm and glass comes out clear. Hello there Kristy, I’m coming at you with more questions ( sorry about that ). I have just been reading up on the Sal Suds and i do know you use it in your liquid Landry soap, but have you used it a long with your powder detergent for an extra cleaning of really dirty clothes…also does this Sal Suds make bubbles or suds ? The video shows that Sal Suds can be used as a spray on stain remover… question, have you used it that way? Sal suds is basically a tougher version of castile soap, although it is more like a detergent. So, do not use it for skin applications. It is is formulated to conquer tough cleaning projects such as unforgiving grease and stubborn dirt. I haven’t used it as a stain remover. I have another recipe for that under the cleaning tab. I may just have to email my dishwasher detergent, it’ll be a few more weeks before it’s published. Thank you again Kristy for your time and consideration to keep me on the right track with going natural!